While you can count the ingredients for the filling on one hand, this pie does take a little planning as you should let your lemons macerate (hang out in sugar) for 24 hours if possible (if not, at least 4 hours; this isn’t accounted for in the timing breakdown above). 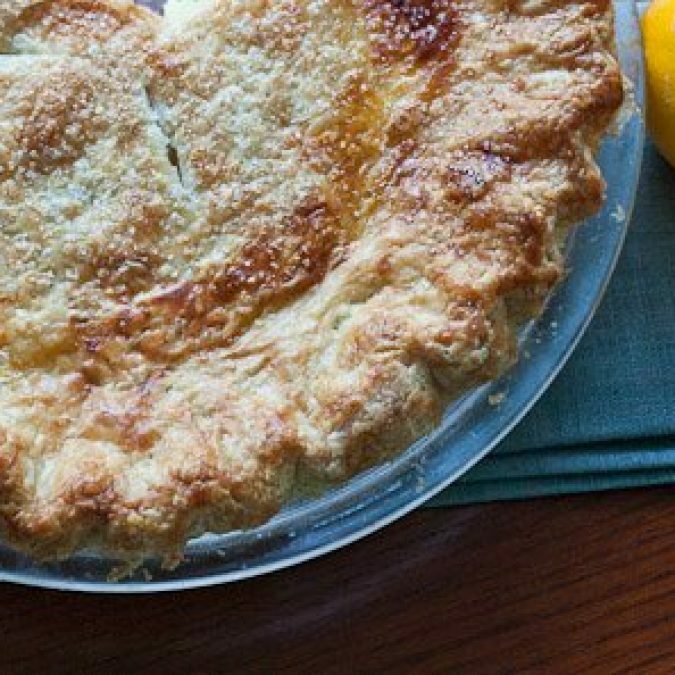 To get a really incredible pie without a hint of bitterness, you want to slice your lemons as thin as possible. I use a mandolin and set it on the thinnest setting possible. You could very well use a sharp knife, too — just go for drapy, almost see-through slices. As for the crust, I love using vinegar in my pie dough–it prevents the formation of gluten (which makes for tough pastry) and helps to create a light, flaky pie. Prepare your lemons very first thing as they need to sit for 4-24 hours (I recommend the latter). Grate the zest from your two lemons into a glass or stainless-steel bowl. Slice the lemons paper-thin, removing the seeds as you go. Put in bowl along with the zest and add sugar. Quickly toss, cover, and let sit at room temperature. Make the dough: Whisk together the flour, salt and sugar. In a food processor or by hand with a pastry cutter, blend the cold cubed butter into the flour mixture until it’s the size of small peas. Don’t obsess about the chunks being the same size. Uneven is good with crust. Work relatively quickly so the butter doesn’t warm. Combine the ice water and vinegar and add slowly in a thin drizzle, mixing during/after each addition. Many factors affect the moisture of pie dough, so you may find you’ll use less water or you may need a little more. Your dough is ready when it just barely begins to clump together and should have some dry bits remaining. Dump dough out onto a clean surface and split in half. Quickly form into 2 chubby disks and wrap tightly in plastic wrap. Refrigerate for 1 hour. You may also make the dough ahead — it’s good for 3 days in the refrigerator. When you’re ready to make the pie, take the dough out of the refrigerator and roll one half into a 13-inch round and fit into a 9-inch pie pan. Trim any overhanging to 3/4 inch all around. Roll the other half into a 12-inch round for the top crust and lay on aluminum foil or parchment. Refrigerate both while making the filling. Make the filling: In a medium bowl, whisk eggs until frothy. Then whisk in butter and flour until mixture is even. If you have clumps from your flour, pour the mixture through a sieve. Stir the lemon mixture into the egg mixture. Pour the filling into the bottom crust. Brush the overhanging bottom crust with cold water, cover with top crust and trim and flute the edges. Cut steam vents in the top crust. If top crust is sloping a bit and it seems like there’s not enough filling, don’t worry–the filling rises and the top crust comes right along with it. Bake the pie for 30 minutes. Reduce oven temperature to 350 F and bake until top crust is golden brown and a knife inserted into the center comes out clean, 20-30 minutes. Let cool completely on a rack. The pie can be stored in the refrigerator for up to days, but let it warm to room temperature before serving.